I know there was one on 51st between Yale and Harvard. And this one mentioned in the ad: 2600 Range Line. Were there more? My mother was a huge fan of Lea's Pizza. Even though we lived "all the way out" at 51st and Sheridan, she would drive to the Lea's on Peoria and 43rd and bring it home. By the time Lea's closed, we had a Kens' pizza nearby where Rib Crib is now located. Although Shotgun Sam's didn't become a franchise licensor, it did produce the next best thing: someone who became hugely successful in the pizza/restaurant franchising business: Ken Selby. Ken worked at Shotgun Sam's before going out on his own. What started out as The Pizza Parlor in 1961 soon became Ken's Pizza, and later Mazzio's. There are around 200 of them, half of which are franchised. In the 1970's store-bought pizza mixes were popular. Besides Chef Boyardee's brand our favorite was Appian Way. We would gather with friends, make a wonderful Appian way pizza and watch Mazeppa some Saturday nights. Good times. Another well-loved pizza place was My Pi. It was the first place I ever had deep dish pizza and I LOVED theirs. I also loved their great Bose sound system in there. In 1977 the Tulsa world ran an article on My Pi which included recipes for their garlic bread and green salad. My Mom must have read this because it was how she always made garlic bread at home, using Pepperidge Farm bread. 1. Whip butter with whisk until light and creamy. Blend in minced garlic and grated cheese. 2. Cut bread diagonally into thick slices. Do not cut through, leaving slices attached to crust. Fill space between slices with butter and cheese mixture. Wrap in foil and heat through, 10 to 15 minutes in a 500-degree oven. 1. Tear lettuce leaves in bite-size pieces, and combine. 3. Place anchovy and onion slices over top of lettuce, and sprinkle with croutons and egg. Serve with Italian dressing. oh how I loved my pi! Former workers at MY TT say that they never used any canned or processed ingredients, only fresh and boy, you could sure tell. Tuesday was a slow night at the 18th and Sheridan Shotgun Sam's so they hired a local Barbershop Quartet called the Sooner Statesmen. I san lead and we did 3 sets every Tuesday night. Besides the standards we learned at chorus rehearsal we had some original barbershop arrangements of Beatles tunes done for us by local song smith and all around sweet heart Irene Nightingale. We got $25 and all the beer the customers wanted to buy for us. We spent the money on pizza. It was fun. I have spent many an evening at the 18th and Sheridan location. I probably heard Bill sing. 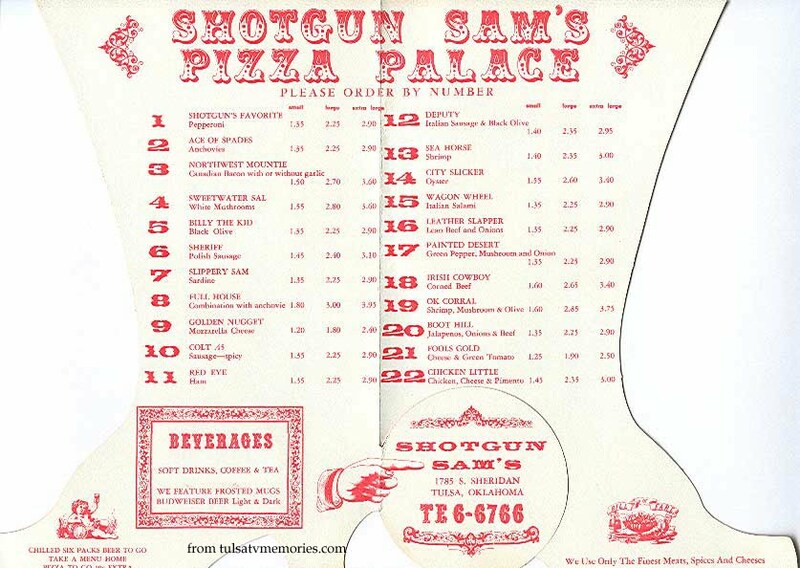 The Shotgun Sam's concept was very similar to Shakey's Pizza...long rows of community tables with individual stools for seating. 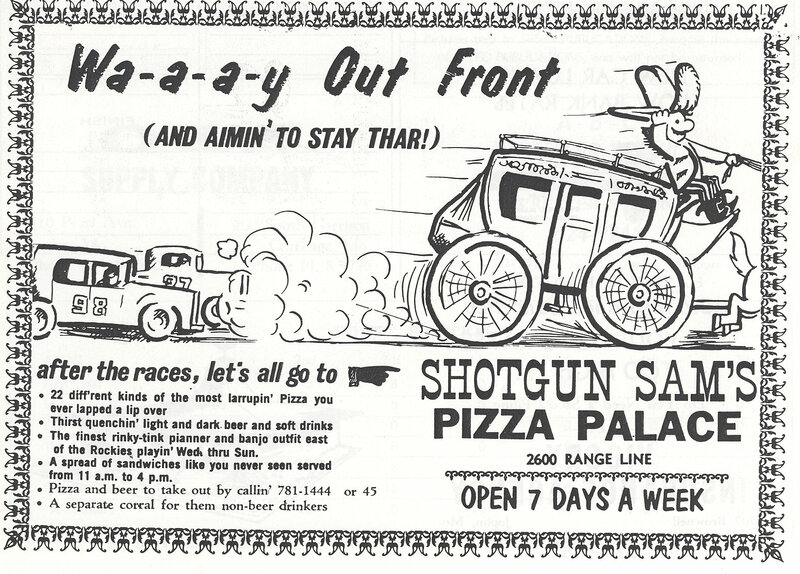 I worked at the Shakey's in Norman while going to school at OU from 1975-78. 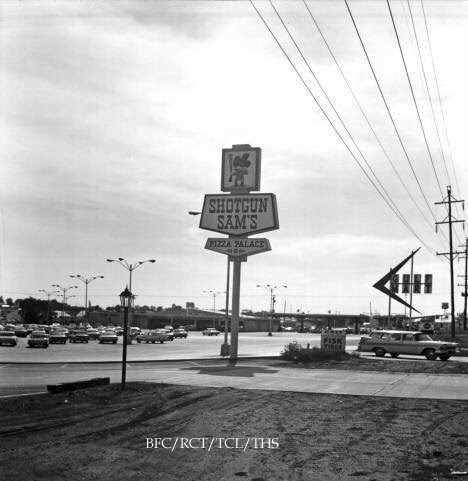 The 2600 Range Line location was in Joplin, MO... around the location of the Lowes now. My Pi was my first real job at 14. A handful of my classmates from Holland Hall and I worked there as busboys. We would compete to see who could cajole patrons to tip the most. I was also there when two masked bandits held us up and made us all lie face-down on the floor. They were pretty rough on one of the cooks and one of the busboys, and they got away with all the waitresses tip money and cleaned out the safe. But, no one was badly hurt. And they were never caught. I think it was a year later a manager was shot during a burglary. Those crooks were caught and prosecuted. Other than that, I have lots of great memories from there. 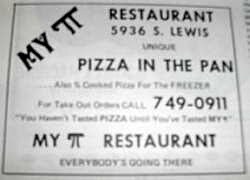 Would love to find a recipe for their pizza. It's still my favorite. I'm Shotgun Sam, the Pizza Man. I run the Pizza Palace. Shotgun Sam, that's who I am, and my horses name is...(horse whinney)..Alice. I came to Tulsa for college (from Erie, Pa...very Italian) in 1977 and searched for Italian food. The closest I found was a place that served chili over pasta. Fortunately, I came upon Mondo's. All of the sudden I was transported back east enjoying spaghetti and meatball, lasagna, and pasta bolognese as good as anything back home. It became my favorite Tulsa restaurant (along with Goldie's and Casa Bonita). Thank you Mondo's...if you're still there.